Get involved and help keep the San Bernard looking beautiful! 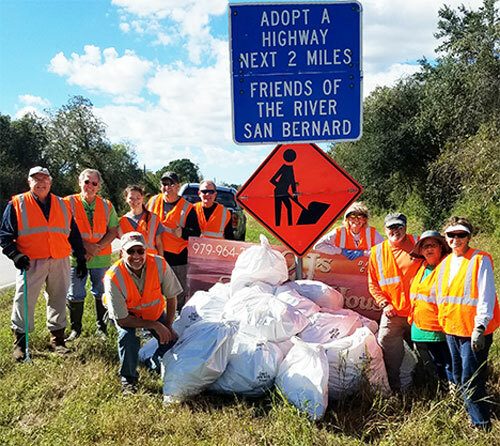 A BIG THANKS to eleven FOR volunteers who picked up someone's carelessly tossed litter along a two mile stretch of FM 2611 at the Churchill Bridge on Sat Nov 3rd. The pile of trash bags piled under the Adopt a Highway sign totaled twenty-three plus a trashed highway sign! The participants included Committee Chairman Mike Pudlo, Tim Logan, Jane Logan, Brian Meagher, Sophia Meagher, Susan Bailey, Bert Smith, Ange Ronayne, Pat Wolever, Denise Wolever, and Wayne Head. Pct 4 Deputy Constable Glenn Whiiesant provided the safety alert to motorists along the pickup area.